Cancer is undoubtedly one of the greatest medical challenges humanity has ever faced. Last year the number of new cancer diagnoses in the USA reached an estimated 1,685,210, with the disease claiming an estimated 595,690 lives. Furthermore, the number of new cases of cancer is expected to continue to rise worldwide right through the second and third decade of this century, hitting a staggering 21 million by 2030. Worldwide cancer deaths are also on the upwards trajectory, expected to increase by 60% over the next two decades. However, taking the United States in isolation, the prognosis is far less bleak. Due to being in the fortunate position of having ready access to quality healthcare providers and first-class research facilities, cancer deaths in the United States have been steadily falling year-on-year. However, to maintain this momentum, and strive towards a future where humanity can be 100% free from the blight of cancer, the research and hard work can't stop for a moment. Rated at the very top of cancer care facilities in the US for the last 28 years, the MD Anderson Cancer Centre is at the forefront of the fight against this disease. MD Anderson offers services covering every stage of cancer care - from preventative measures, such as state-of-the-art screening and family history advice, to the most modern and up-to-date treatment programs available. One of the core elements of the MD Anderson Cancer Center is the Innovation Center. Tasked with "a mission to uncover and develop technology opportunities that eliminate cancer worldwide," the Innovation Center is "combining human-centered design principals with real-world health care needs," and is "driven to think big and transform the cancer care experience inside [its] walls and beyond." Striving tirelessly to keep MD Anderson at the very top of the cancer care game, the Innovation Center is constantly on the hunt for partners who can work with them to use technology in order to tackle cancer in new and innovative ways. It is this commitment and investment into technological innovation which led MD Anderson Cancer Centre to come up with the idea of bringing other innovators from all over the world together in order to showcase and develop their ideas, united under one banner. 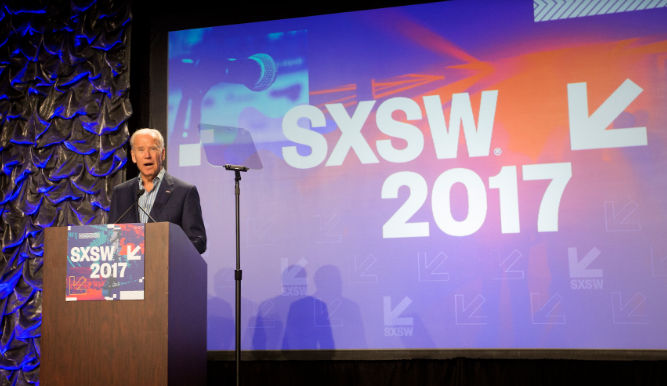 And so it was, on March 12th, 2017, at South by Southwest in Austin, Texas, MD Anderson put on Connect to End Cancer - a meeting of cross-discipline minds, with the goal of improving the cancer patient experience for all. One panel (hosted by MD Anderson Cancer Center itself) focused on how healthcare facilities can compete with one of the greatest challenges to have risen from the information age - trying to teach ordinary people how to source reliable information from the internet. With the public, for the most part, struggling to tell bogus advice apart from reliable information, the prevailing predilection many have for sharing hearsay and myths on social media sites, and the celebrity endorsement of various erroneous health products, this is indeed a pressing concern for all in the healthcare industry. Former vice-president Joe Biden took to the stage to discuss (amongst other things) the White House Cancer Moonshot Initiative, which aims to speed up cancer research by removing as much of the bureaucracy and red-tape around it as possible. MD Anderson itself has several Moonshot programs running at any one time. As part of the Moonshot Initiative, MD Anderson offers schools two digital learning aids designed to teach children and teenagers about how to prevent two of the most common causes of cancer in the world - the Sun, and tobacco. ASPIRE is a bilingual tool aimed at middle and high school children that teaches all about the dangers of tobacco. The program is made up of videos, games, and animations, backed up by testimonials from doctors, other children and teenagers, non-smokers and smokers. There are also tests and quizzes to take, and certificates for those who complete the course. Due to be updated to cover hookahs, e-cigarettes, and synthetic cannabis, ASPIRE is keeping pace with research and society in an effort to keep kids away from tobacco and other smoking substances. With one in five people developing skin cancer over their lifetime, and chances of melanoma doubling with just a single instance of sunburn during childhood, it is crucial to teach children and their parents about sun safety as early as possible. Sunbeatables is another brilliant online learning experience, featuring a quintet of adorable child superheroes, which uses evidence-based tools to educate children and parents on everything from making sure to play in the shade and the importance of dressing appropriately in sunny weather, to which sun-cream to use and how to properly apply it. MD Anderson Cancer Center is succeeding in its goal of bringing people together to take cancer prevention to the next level. By engaging directly with schools and the community, the Center is helping the public get the correct information about their health, and has many more programs lined up for the future. The last word goes to Connect to End Cancer panelist, Mark Ganz. "I like the idea of curing cancer, but also focusing on the journey of the family; not everyone is going to make it out alive, so we owe them fresh thinking. [...] If we do it well with cancer, we will do it well with other diseases." Hear Kathy Denton, Associate Director of Patient Experience of the MD Anderson Cancer Center, at Next Generation Patient Experience this year.